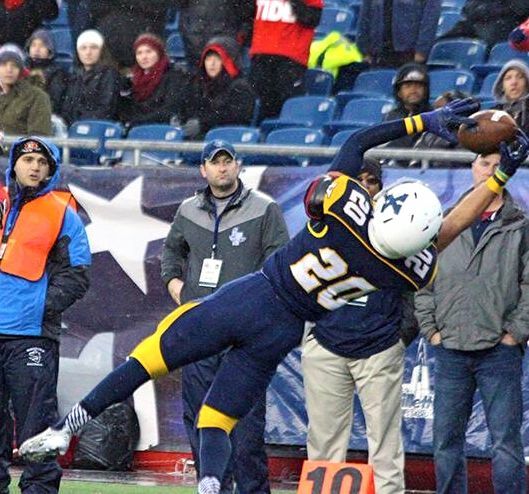 Xaverian may have the best secondary in the state, led by senior corner Coby Tippett. Photo courtesy of ESPN Boston. We already covered the Heart of the Commonwealth yesterday with our Week 3 Central Mass Power Rankings, now let's move east where a few teams continued to impress, while a few others got back on track. I won't waste any more time with introductions, let's just get to this week's Top-10. Last Week: Ranked No. 1, defeated Stoughton 31-6. Another week and another dominant performance for the Rams and the quarterback-tight end combo of Jack Masterson and Danny Dalton. Those two combined for a pair of touchdowns through the air, but what may separate Marshfield this year is it's dominant, but somehow unheralded defense, and a massive offensive line that simply wears down opponents. A big test awaits next week as the Rams hit the road to face league rival Dennis-Yarmouth. Last Week: Ranked No. 2, defeated Bridgewater-Raynham 27-0. What more can you say about the Hawks' defense other than it continues to impress. Against a good B-R offense Xaverian stood up and pitched a shutout, and the offense came to play as well, rushing for over 250 yards and three scores in a route. Last Week: Ranked No. 3, defeated No. 6 Central Catholic 22-16. We saw St. John's Prep blow out a good Mansfield team on opening weekend, but Saturday we learned that the Eagles could come from behind and gut out a win on the road against one of the state's best teams. Some clutch plays by senior quarterback Oliver Eberth sparked the Prep offense after a stagnant first three quarters, and the defense continued to excel. The Eagles will finally open things up at home next week after two monumental road challenges, but things will get no easier as Everett comes to town. Last Week: Ranked No. 4, defeated Barnstable 61-6. The Eagles are flying high offensively yet again, ripping up Barnstable in a game that was over before halftime. Next week's trip to Andover should bring a much larger challenge, then a home game against Brockton to start the month of October could challenge BC High's toughness defensively. Last Week: Ranked No. 5, defeated New Bedford 23-0. The Crimson Tide got back on track with a routine shutout of New Bedford, but questions still abound on offense. Can Everett hold onto the ball, and can an inexperienced supporting cast bring out the best in uber-talented junior quarterback Jordan McAfee? We'll know now A LOT more next week when the Crimson Tide travel to face No. 3 St. John's Prep. Last Week: Ranked No. 9, defeated No. 10 Duxbury 39-35. After losing so many players from last year's Division 4 state championship team, many worried that the Panthers would take a step back offensively. I think we can safely say that isn't going to happen, not with junior quarterback Jack Barrett playing the way he is. The dual-threat signal caller threw and ran for three touchdowns in a huge showdown with Duxbury last week, and it's hard to see anybody in Division 4 slowing Holliston down right now. Last Week: Ranked No. 7, defeated Needham 20-7. It was a solid all-around effort for the Rebels Friday night, as they played a clean game and were never really challenged by Needham. Walpole will now hit the road for a critical league game against undefeated Milton. Last Week: Ranked No. 6, lost to No. 3 St. John's Prep 22-16. Kind of hard to hold this close loss against the Red Raiders, who were previously routed by St. John's Prep in last season's Division 1 North semifinals. This year's incarnation of CC comes packed with plenty of speed, particularly on defense, and seems to have the grit to play with anyone. The Raiders were a play or two away from a big jump in our rankings, but don't sleep on them the rest of the year. Last Week: Ranked No. 8, defeated Weymouth 34-7. The Boxers bounced back from a sluggish offensive opener against Fitchburg to light up Weymouth, behind the running of Dominic Simpson and Edmund Kelsey, along with some big plays on special teams. Brockton is still without star running back Kerry Raymond, but with other options emerging, and the Boxers making plays in other phases, they may be able to weather the storm. The Golden Warriors haven't yet been challenged in what they hope will be a season of redemption in Division 1 North. They've had their eyes on Merrimack Conference rival Central Catholic since the Red Raiders knocked them out of the playoffs last year, but this week brings another huge challenge; a home date with No. 4 BC High. There's certainly no shame in losing to a team like Holliston, especially with as well as Duxbury played to keep things close with the Panthers, but the region is so loaded with quality teams that somebody had to fall out. The Dragons and their potent passing attack will no doubt be heard from again this year.